Peanut butter chocolate chunks flour selective focus. Ingredients for baking. Alarmed one day a few weeks ago as I made the devastating discovery there was NO CHOCOLATE on the menu at Cinnamah-Brosia’s Coffee Cottage and Gift Shop, I needed help! Facebook is a great venue for interacting with you, our readers, and that’s exactly what I did. 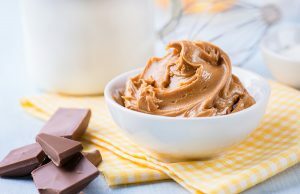 (If you don’t already follow us, please do: Lynn U Watson) Through a plea to share your favorite chocolate recipes we scored a new one: Chocolate Covered Peanut Butter Ritz Crackers. Thank you Teri Siebert! Here are directions for making one of her family’s very favorite treats. Melt a couple of large Almond Barks in a double boiler. while melting spread about 1 teaspoon of peanut butter between 2 Ritz™ crackers. Then dip the peanut butter Cracker sandwiches in the melted chocolate and lay on wax paper until the Chocolate hardens. They are YUMMY! Ruby Red Pomegrante and Orange Scones!